Mind the gap – how close do cars come? How much room does a driver give a cyclist when overtaking? What do you do as a cyclist when a car is passing you? How straight is the line you ride as vehicles pass you by? 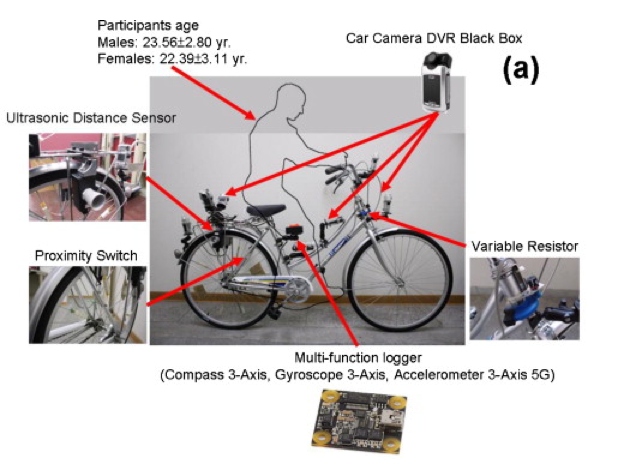 A group of scientists in Taiwan built a special bike to answer these questions and more. It was instrumented to record lateral distance from the passing motorists, wheel angle and speed control. That’s a lot of special kit to add to a bicycle on city streets. It includes an ultrasonic sensor, camera, a variable resistor in the headset and a solid state compass, gyroscope and accelerometer. OK, it costs less than a CF disc wheel but it’s a lot of value to expose to potentially hazardous situations. • motorbikes passed more closely to the bicycle than cars and trucks did. • motorists pass closer to men than women. This last point confirms the 2007 findings of Dr Ian Walker of Bath University and some subsequent US research. However, what’s not clear from the latest research is how much the beaviour of the riders and the drivers was influenced by the test itself. The riders would’ve at least been aware of the equipment of the bike and so may have ridden differently from normal. Likewise the motorists could’ve seen the oddly-equipped bicycle and so changed from their normal steering pattern. Nevertheless, I like this kind of research because it attempts to quantify experiences familiar to every cyclist and so it helps by converting anecdotes into evidence that may be used to improve road safety. This entry was posted on 02/04/2013 at 12:35 pm and is filed under Technology, Traffic, Uncategorized. You can follow any responses to this entry through the RSS 2.0 feed. You can leave a response, or trackback from your own site.